It also aims to provide an opportunity for flutists in Southeast Asia and Korea to interact and create integrated renditions of contemporary and traditional songs targeted to be appreciated by the general public, most especially the youth, while also incorporating classic and modern approaches in music-making. 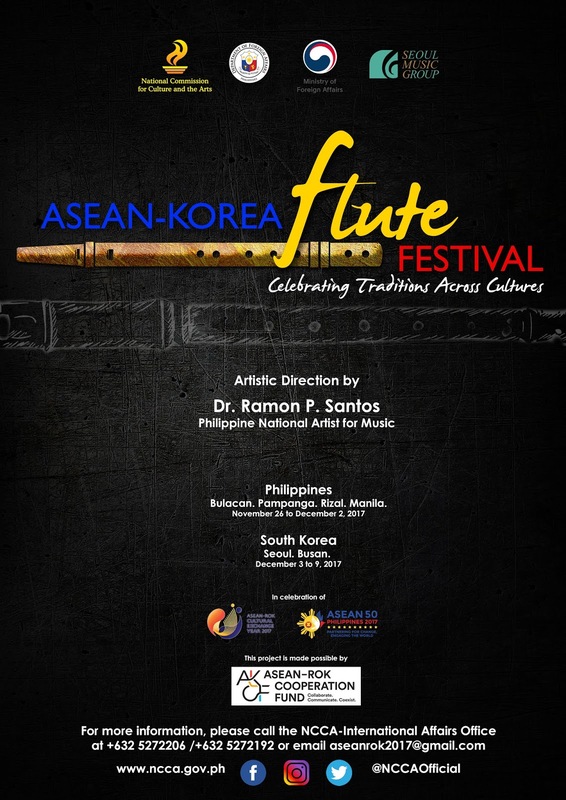 Featuring the artistic direction of National Artist for Music Dr. Ramon P. Santos, the ASEAN-KOREA Flute Festival is set to break new grounds for deeper sense of cultural awareness and for better understanding of our shared musical heritage with neighboring ASEAN countries and Korea. The upcoming music festival is a joint project of the Philippines and Korea, with funding support from the ASEAN-Korea Cooperation Fund, as part of the celebration to commemorate the 50th Anniversary of ASEAN, the 25th Anniversary of ASEAN-KOREA Dialogue Partnership, as well as the ASEAN-Korea Cultural Exchange Year 2017. 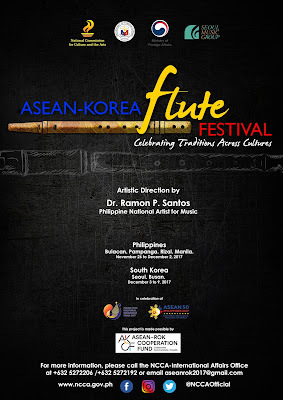 For more details about the event, please email: aseanrokflutefestival@gmail.com or visit the event page: www.facebook.com/NCCA.ASEANPH.